It has been a while since my last post. I have been extremely busy with both my personal life and work. I got married on the first of July, went to the Caribbean for my honeymoon and then straight to Germany for the OutDoor Tradeshow (trip report coming soon). Now it is time to get back to work. I have a lot of gear reviews planned and a few trip reports to post. I even have some personal rambles that I may post (still debating whether or not to post because of backlash over some topics). Over the last few years I have been a huge proponent of Haglofs. Their quality is first class and the fit is perfect for me (athletic and slim fitting). I have been hard pressed to find a softshell jacket as good as my Haglofs Savage softshell jacket. With that being said I have always been on the lookout for my next softshell jacket, always assuming it would be another Haglofs jacket. Well, back in late spring I got a new softshell jacket. It wasn't a new Haglofs jacket, but it hasn't replaced my Savage either. I have used it a good bit though and thought it would be time to review it on White-Knuckled. The Mountain Hardwear Trinity softshell jacket is a great jacket with tons of features and a great overall fit. Their new proprietary fabrics and quality construction now put Mountain Hardwear at the top of the technical outerwear list along with Mammut, Haglofs, Norrona, Patagonia and others. 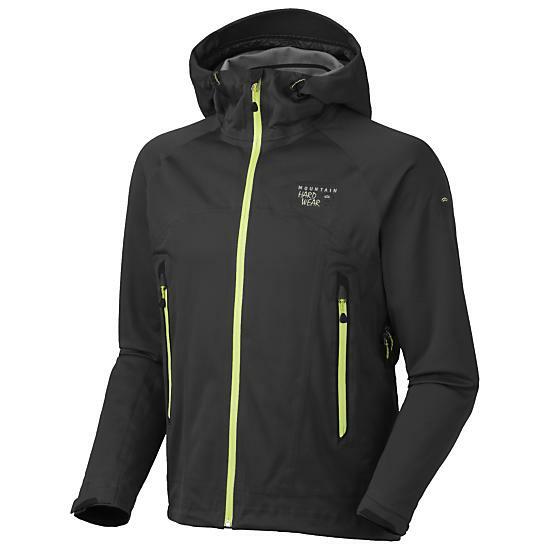 The Mountain Hardwear Trinity softshell jacket has some fantastic features. First of all Mountain Hardwear is now using its new proprietary fabrics called Dry Q. They have a "Core" line, an "Elite" line and an "Active" line. The Active line is really reserved for active outerwear like wind shirts and running apparel. This fabric breathes the best while still offering protection from the elements. The Core fabric, which the Trinity uses, is basically a step down from the Elite fabric. They are both waterproof, windproof and breathe incredibly well, but the main difference is that Elite fabric has "instant on" technology. Basically it starts working right when you put it on and does not require body heat to activate breathability like most other waterproof/windproof fabrics. Mountain Hardwear has been able to change the breathability and protection features of their fabric because they have actually gone back to the manufacturing level of apparel. They are engineering layer by layer new fabrics to compete with the likes of GoreTex, eVent and Polartec. I must say that they have done a very good job. My Trinity jacket is completely waterproof/windproof, but it breathes better than any GoreTex softshell I have used. Overall this new Dry Q technology is moving Mountain Hardwear ahead of some of the competition. Disclaimer on this next part. I am a gear junkie. This means that I rarely buy a product unless it is perfect. This is why I generally have positive reviews for the products I test or own. My basic thought process is that if something is missing or wrong, in a product, it is going to piss me off for as long as I own that product. Plus, if one company doesn't do something right, say adjustable cuffs, I feel there has got to be a company out there that does! I refuse to buy products that don't have full feature sets or skimp on things that I think absolutely must be there. Soapbox speech done! With that being said, the actual functional features of this jacket are good as well. The jacket is very stretchy and moves with me while hiking and ice climbing. It offers welded zippers everywhere which means that pockets and entry into the jacket are completely waterproof and windproof. The hood adjusts in two ways so that it really cradles your dome and it can even accommodate a helmet. The last feature that I think is important and Mountain Hardwear included is velcro adjustable cuffs. It is just nice to have that adjustability instead of a gusseted cuff. The fleece backing on the inside makes this jacket comfortable as well and adds a little bit of heat retention. As with every piece of technical apparel there are some misses and the Trinity is not immune to that. For everything Mountain Hardwear did correct, they really missed on a few aspects. First is the lack of a two way zipper! In this day in age unless a jacket is meant exclusively for rain I don't see why there is not a mandatory two way zip. Especially when it comes to softshells as those are typically worn for more technical adventures where, oh I don't know, you might have a harness on. To be able to zip the bottom button up while belaying or at an anchor station is huge. The Trinity misses by a mile on this feature. The next would have to be the lack of a Napoleon pocket. This could be on the inside or the outside, but I think pretty much every technical outerwear piece should have one. They are great for quick access to food, camera or gear without having to use the hand warmer pockets which are typically reserved for gloves or...warming your hands. There is an interior baggy mesh pocket, like a ski skin pocket, but I don't like the lack of a zipper for security when you might take off your jacket or it gets flipped upside down. The last miss is the terrible placement of the internal hood cinch pulls. They are placed inside the jacket by the chin guard and just dangle around. If the jacket is zipped open even a little bit the pulls flop around and look like walrus tusks. Very bad miss on Mountain Hardwear's part. Most companies are at least tacking those pulls down with guides or something. So annoying and really bothersome. Sorry for rambling on, but if you are spending $300+ on a softshell I think giving more information than less is a good thing. Let me know what you think in comments and if you have this jacket tell me if you think my review is accurate. The Trinity is a great overall jacket, but a few key misses could put it in second place to comparable softshells. I highly recommend this jacket if you can deal with the short comings. Do find this to be your favorite shell mountain hardwear makes? Would you prefer a different one of their shells to this one? Is there another brand's shell you would rather have over this? I think the Kepler from Mountain Hardwear might be a better overall choice, but I got the Trinity for free. Can't complain. I think that Haglofs will have some of the best softshells this fall and i love mine that is 4 years old. Norrona has some great stuff too and of course Mammut always has stellar jackets. The Castor pant is probably the best softshell pant ever!!! Hope you find something that will work. Thanks for the review! I was looking at soft shells earlier this week but didn't decide on anything. Haven't tired a Haglof piece and after hearing your feedback on them I feel like I owe it a shot. Tell Mr. Snorkles I said Hi. Yeah Nate. Haglofs is definitely great. Sierra Trading Post is the only retailer in the USA to sell their stuff so keep your eyes open for it. Should have some more there later this year. Which Haglofs softshells do you recommend? be nice to have a opinion before I keep looking. Thinking about the keplar too which also looks nice! The Mountain Hardwear Kepler is a great jacket. It was actually the jacket i originally wanted to get. For Haglofs softshells i would recommend the Eryx (what i have), Sirocco and Swift for good overall windproof protection. The Suta is awesome and offers even better protection, but is a little heavier. WK, what are your thoughts on using this jacket for snow skiing? I would not recommend this jacket for snow skiing. There is no powder skirt and no wrist gaiters or other ski jacket features. If you want a back country ski jacket i would recommend something like the Mammut Parinaco jacket. If you are talking inbounds skiing i would just go with a ski brand jacket.